It is our great pleasure to announce that “Samurai Accountant” has recently been published. The book, subtitled “Yukuo Takenaka, the John Manjiro of the Showa Era,” tells the life story of Mr. Yukuo Takenaka, President and CEO of Takenaka Partners LLC. 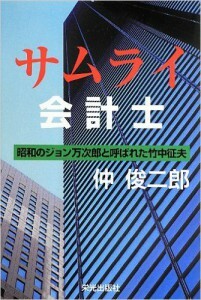 Written by Mr. Shunjiro Naka and published by Eiko Shuppan, “Samurai Accountant” describes Mr. Takenaka’s long history of successful cross-border M&A transactions for Japanese companies, beginning with his employment as the first Japanese CPA in the US at at KPMG, one of the major international CPA firms to this day.